As mentioned in our previous blog on rice bran, rice is cultivated in every continent of the world except Antarctica. In total, there are more than 100 countries that produce rice. Before rice becomes shiny edible rice kernels, it requires processing, known as milling or polishing, in which the rice bran and hull are separated from the kernel. Rice bran accounts for about 12% of the entire rice grain, which is rich in lipases. Due to the instability of the lipases, rice bran must be stabilized quickly after the milling process to maintain nutritional quality and prevent rancidity. A common way to stabilize rice bran is by using high shear dry extrusion. At Insta-Pro International®, we have conducted animal trials to optimize the nutritional quality of rice bran utilizing high shear dry extrusion technology. With increasing feed ingredient costs and demand for more sustainable ingredients, utilizing high shear dry extrusion to stabilize rice bran is a viable low-cost and sustainable solution. When compared to typical grain diets, how can dry extruded stabilized rice bran be included or substituted for higher cost ingredients? Dr. Dave Albin mentions here, that utilizing high shear dry extruded stabilized rice bran in nursery diets, you can remove corn and more expensive solvent-extracted soybean meal, reducing your overall diet cost by $4/ton. High shear dry extruded stabilized rice also improves digestibility and animal performance when it’s included in the production animal’s diet at a 10-12% inclusion rate. One example, showed a 4% improvement in the growth to feed ratio when added to a nursery pig diet with a 10% inclusion rate versus a conventional diet or a diet where antibiotics were added. 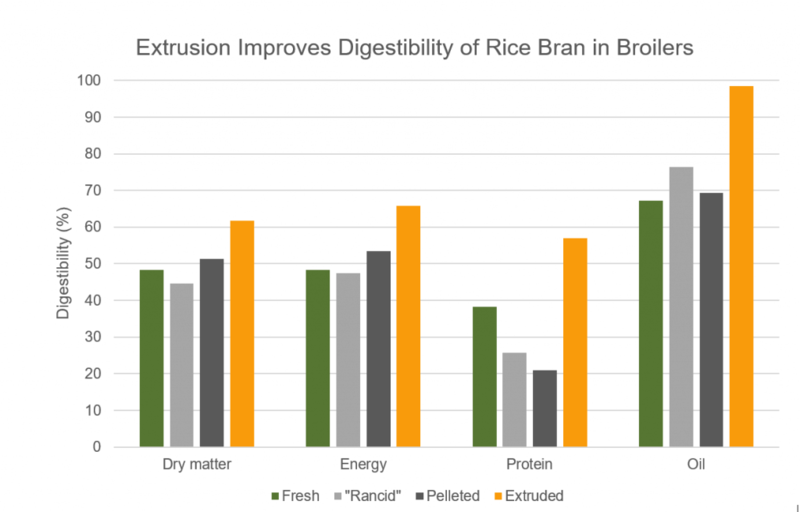 Another study showed higher overall digestibility, including dry matter and protein (p < 0.05), when high shear dry extruded stabilized rice bran was added at a 10% inclusion rate in a poultry diet compared to other diets (shown below). In summary, stabilizing rice bran through high shear dry extrusion has many benefits, including: reduction of the overall diet cost when replacing more expensive ingredients with stabilized rice bran and improving digestibility and performance by providing quality nutrition. If you are interested in stabilizing rice bran or learning more about the process, give us a call.